For the past year I have been working with a lovely family in Turramurra, on Sydney’s north shore, after we first me when our house in Balgowlah was on the market a few years ago and the Hamptons coastal style I had created in our home caught their eye. I have been helping them create their Hamptons inspired dream home which began in earnest at the beginning of the year. The house has been transformed into a stunning family home, based on a classic blue and white scheme, and they have been an absolute delight to work with from start to finish. The house is now on the market (view here) as they have bought a larger house to accommodate to their family of three girls, and I thought I’d share with you some of the interiors I designed for them. The first task we undertook with this house was to update the exterior, starting by repainting the house and adding some decorative features including a new awning, new paving laid around the pool, the cedar shingle roofed walk-through pavilion, lining boards on the exterior ceilings, landscaping, exterior lighting and door hardware. For the interiors, my clients wanted to create an East Coast/Hamptons feeling, with lots of blue and white, dark timber floors, white walls and traditional American style kitchen. The aim was for relaxed sophistication, coastal not beachy, and a home that was at once welcoming and comfortable but exuding style and elegance. What a gift! They were very open and easy going, readily taking my recommendations and ideas, and willing to try new things. On top of which they were eternally patient and never stressed out, even when things occasionally went wrong or were delayed. I can only hope all my clients are so amazing, as it makes my work not only easy but pleasurable. After our initial consultation, my clients worked with DeGabriele Kitchens to create the stunning kitchen, which was installed after the carpet and tiles were all removed and replaced with dark stained wide plank oak flooring. A wall separating the kitchen from the family room was demolished and all existing joinery, benches and appliances removed. This created an open clean space within which to create the new kitchen and family area. The walls were painted a Benjamin Moore grey, the gorgeous gray washed cabinet bought to house decorative objects and touches of blue and white china and custom roman blinds made in a crisp linen with thin navy pin stripe. In the family room, existing wicker sofas, occasional chairs, entertainment unit and coffee table from Coco Republic were reused, with chairs re-upholstered in practical indoor/outdoor fabrics, ideal for stain and fade resistance. I added interest with details such as the contrast piping and a mix of floral, stripe, geometric and plain patterns. 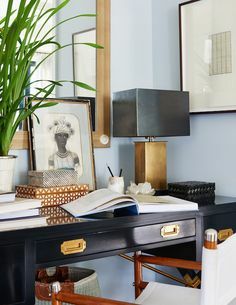 The addition of the plants, side table, decorative accessories and lamp make the room inviting and cosy. The entrance foyer includes a staircase leading to the upstairs bedrooms. These were stripped of carpet and painted white, a sisal runner added along with bench seating and cushions on the box seats up the stairs. We used the existing furniture in the entry adding accessories, such as the blue and white ceramics, the custom made lamp and the sisal rug. 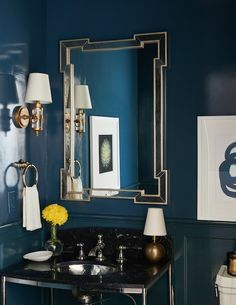 The powder room located off the entry was retiled using a black and white marble basketweave mosaic, and wallpapered in a beautiful blue and white medallion paper, then new faceted pendant light and black beaded iron mirror were added. I’m so thrilled with the way it turned out as it evolved into a big project over the year, but I’m happy to say we are all delighted with the result. Stay tuned for the next instalment of this beautiful family home. For more details visit here. P.S I love the side table in the living room- where is that from? It’s a one off I found. Oh and those stairs… not seen an all white staircase in a long time! So refreshing. I used a few – Vivid White, Whisper White, and some greys too. I love it. Particularly how you have nailed coastal not beachy. That’s what I want for our home too. Love the whole look. Your a very talented lady Mel beautiful job. Absolutely beautiful, your magic eye has been hard at work again. Well done! I am in love with the powder room wallpaper – would you mind letting me know what it is? Absolutely stunning, I love the transformation and your choice of colours, patterns and artwork, especially the large horse artwork in the hallway. The new kitchen is beautiful and very similar to the kitchen in my new coastal home in NZ which is currently being built. I much prefer a traditional style style kitchen as I feel they add charm and character and at the same time are timeless. I love your design work, it is gorgeous. The flooring is so beautiful and the kitchen drawer pulls wonderful…all is just stunning thank you for the before and afters you really understand the work and decisions that went into your beautiful home. Absolutely beautiful. I’m in love with the Powder room wallpaper! Where is the horse painting located on staircase, from? Love the exterior colour – very Hamptons. What is the colour? well done again Mel. Looks devine. 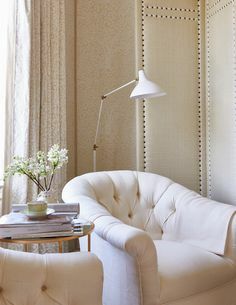 What is the name of the Benjamin Moore grey paint you used? Thank you. Wow I love it! Where did you source the basket weave tiles in the toilet? They’re gorgeous! From a tile shop in Brookvale called My Stone. Yes I’m utterly hopeless at them too, especially the large expensive ones! I am soon to launch an online catalogue of my signature collection of favourite pieces, which will sell my preferred artificial plants as well. If you are desperate for something now I can send you some information if you email me. I just love love love the kitchen. Where are the bar/counter stools from? Just what Im looking for! Hi Liz, I bought them years ago on an Ebay store. M.
Lovely transformation! Love the staircase runner! Who makes it? Is it real sisal? Thanks! Can you please let me know where the black exterior chandelier light is from? Yes it’s from Magins Lighting in Willoughby. Hi Sarah, it’s from one of my lighting suppliers.